Our conversation meandered. We spoke about his journey from finance to graphic design and then to painting. 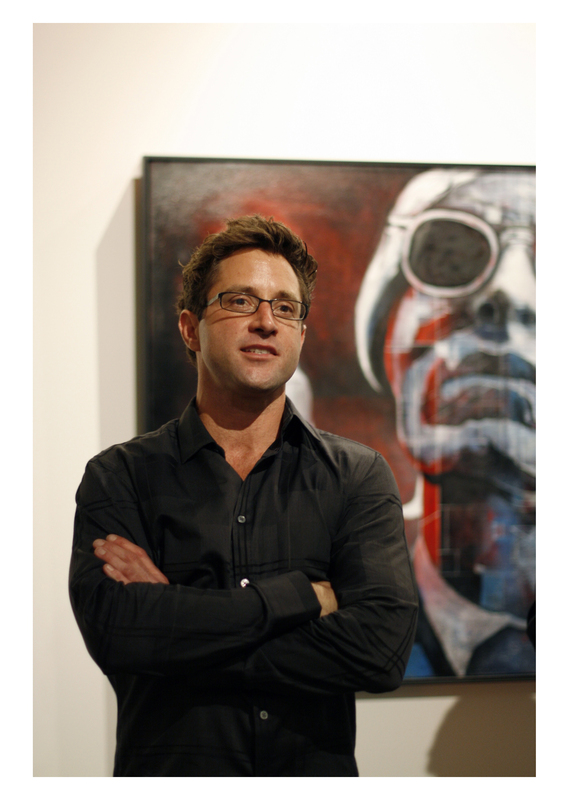 We spoke about the “big break” – getting a solo exhibition at a fine art gallery without the requisite CV – no group exhibitions, no art awards, no articles in prestigious art journals, no work in prominent private or public collections. We spoke about philosophy – Aldous Huxley’s “Brave New World” instead of George Orwell’s “1984”; how we seemed to have ended up in a world of information overload, where it is hard to know what is true and where we are desensitized to what we see and what we hear. But mostly, we spoke about how we as human beings explore and make sense of the world around us and our place in that world. It was not the conversation that I had expected. I met with John Waguespack at the McLoughlin Gallery, the site of his current exhibition of new works. Joan McLoughlin, the gallerist, was there with John. Initially, I was most curious about how an unknown artist garnered a high profile solo exhibition. Joan shared her experiences working in start-up companies in Silicon Valley – a successful career that allowed her to pursue her passion for art and become a gallerist. She considers herself very fortunate and so part of her mission in the arts is to share that good fortune. She gives back a portion of all sales to charity. And, she is also very open to exhibiting new artists and giving them the opportunity to be seen. A mutual friend and a fan of John’s work (which he became acquainted with through San Francisco Open Studios) made the introduction. The large-scale mixed media works were very much in keeping with Joan’s sensibility. More importantly, she was able to relate to his work intellectually and emotionally. The paintings were social commentary without being obvious. Those factors, combined with what had become a substantial body of work, led her to offer John the exhibition opportunity. This is the first solo exhibition she has mounted for a previously unknown artist. John grew up in the South. The boom and bust times of the dot.com era in the 90’s and early 00’s, combined with a business school education, brought John to the West Coast. He started out with a Japanese company in Silicon Valley helping them to market bad technology on the path to bankruptcy. It was a blessing. He received a severance which allowed him to contemplate the possibility that he was on the wrong path in life. Returning to Atlanta, he attended a design school. This was a step in the right direction, though still not entirely fine art. He got a job with an ad agency back in the Bay Area. Surviving there for nearly five years, he was able to land another severance package. This afforded the luxury to reinvent himself yet again – this time as an artist, a painter. For the past several years, John painted nearly full-time, much of that time in semi-isolation. 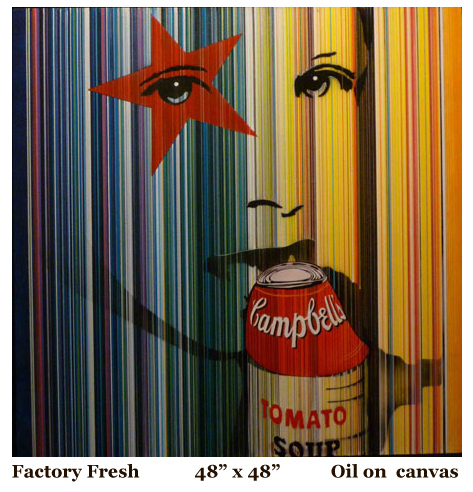 He exhibited his work in Open Studios and in alternative venues, but mostly he just painted non-stop. He retained some graphic design jobs to help pay the bills, but his focus was his art. From his earliest experiences in school, visual vocabulary had always made more sense to him than written vocabulary. He now firmly committed himself to exploring the world and his relationship to the world using that vocabulary. Growing up in the South, which is quite conservative and was even more so then, John did not “come out” as a gay man until he was 26. This was a watershed moment for him. In one of the prominent works in the current exhibition: “1971”, John re-visited the year in which he was born. He wanted to go back to “the beginning” and re-think his upbringing and his assumptions. His approach is interesting. As a culture, we have a very constrained attention span. The media takes a complex series of events and edits them down to sound bites. John’s work is very much a product of these times. He heavily researches his materials. Then he distills the result in ways that say as much about him as they say about the ostensible subject. It is transformed into a series of visual bites. 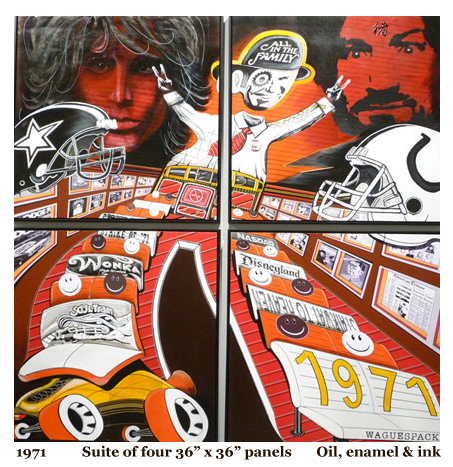 1971 is deconstructed, and then reconstructed as a highlight film: Jim Morrison and Charles Manson; The Colts and the Cowboys; Soul Train and Nascar; Nixon and All In The Family. 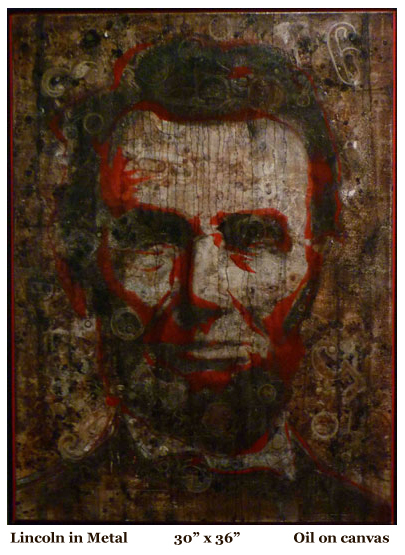 In another work, “Lincoln in Metal”, John visually poses the question: “What would Lincoln think of the current world if he was reincarnated today?”. This is a heavily textured work built up in many layers. Layering is not so much a reflection of conscious technique as it is a reflection of sub-conscious process. It is like an internal dialogue on the subject. Ideas are entertained, modified, rejected, accepted, and finalized. Only, instead of a verbal dialogue, in this case it is a visual dialogue. And, the layers of the re-worked surface are the wake it leaves in the water. 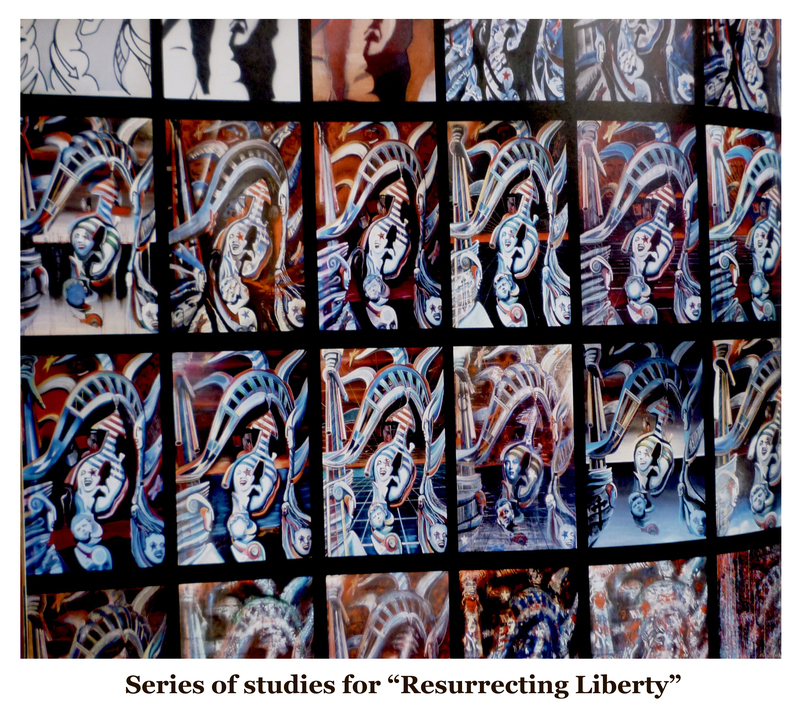 Perhaps the best example of this process is his work: “Resurrecting Liberty”. Here John explores the world in the aftermath of 9/11. It is a great example because the consequences of 9/11 continue to unfold. So, he kept re-painting the work over and over again. Fortunately, he pulled out digital points in time along the journey. This leaves us with a record of the internal dialogue. He said that he wishes that he had kept some of the works, rather than painting over them as his point of view on the events changed. However, I believe that conceptually it is the process of visual exploration that makes the work interesting; and if there are casualties along the way – so be it. I often ask artists how they know that a work is done. John’s answer to the question was very illuminating. He said that he knows that he is done when a work stops bothering him. The current exhibition at McLoughlin Gallery has been extended through mid-January. There is a “First Thursdays” reception next week on January 6th from 5:30-7:30 pm. McLoughlin Gallery is located in the 49 Geary gallery complex near Union Square. After the exhibition closes, work can be viewed by appointment.